It is a dance performed on the wooden dummy horses. It has it’s origin from the bandit regions of Shekhawati. The dance starts from right side. In Rajasthan it is performed by these communities, Potters, Kamdholi, Muslims, Sarghara, Bhambi and Bavi communities. This dance is the main source for them to earn their livelihood. The wooden horse is tied around the waist of the dancer. 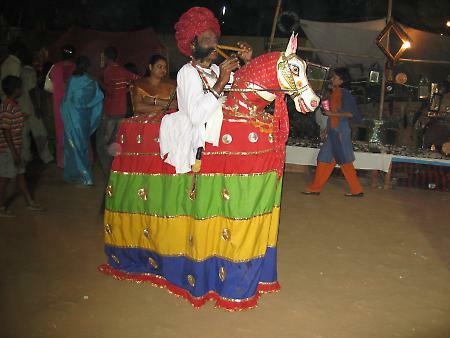 The horse does not have any legs but the dancers legs are covered so that it is not visible to the out side world. These wooden frames are made out of wood and sometimes of bamboo. The community dancers make good money during the marriage ceremonies. The dancers have colored costume with sparkling borders and carry naked swords. There is an interesting story related to the dance. It goes back to Mughal and Maratha regime. The Mughals once came ridding on the horses and halted at one of the Maratha village. When they went to sleep the Marathas came and stole the horses. Later the Pathans found the horses and then it resulted in the war which was known as horse war.